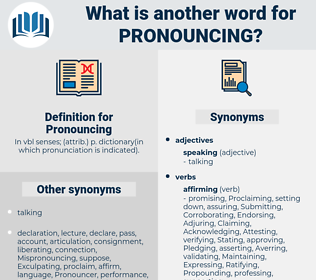 What is another word for Pronouncing? In vbl senses; ( attrib.) p. dictionary( in which pronunciation is indicated). 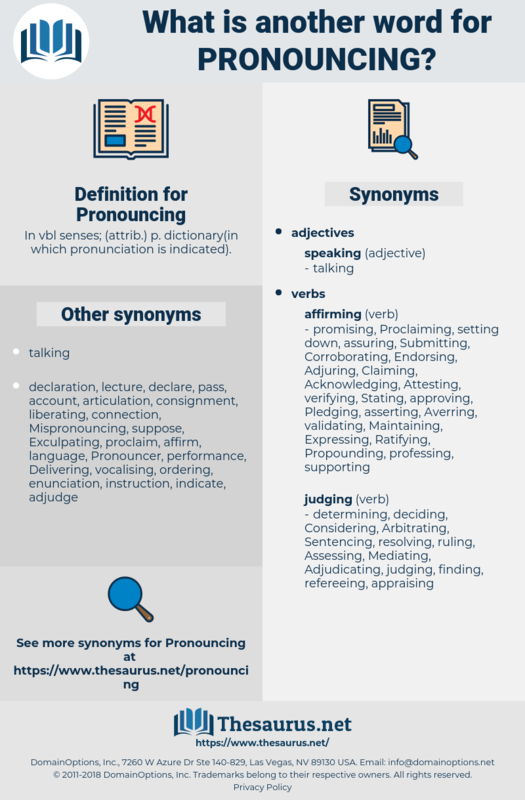 Promulgating, rendering, Recommending, speaking, Prescribing, Declaring, Commenting, issuing, ordering, Placing, deciding, ruling, imposing, Enacting, singing, voting, saying, Dictating, passing, Granting, giving. They would surely be pleased that she was to become at once self - supporting; for only a day or two before this she had overheard some talk between her cousins Arabella and Olive in which they spoke of the expense their father and uncle were at in supporting their orphan cousins, pronouncing it a shame that it should be so now when everything was so costly in consequence of the war.